Early identification and diagnosis are key to maintaining optimal eye health. 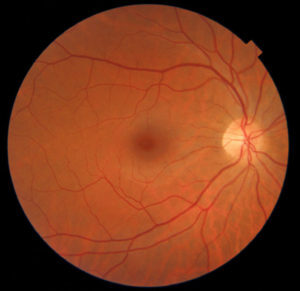 Digital retinal imaging technology is a great tool in helping assess the health of your retina, optic nerve, and relating structures like critical blood vessels. A high-resolution digital image of the back of the eye is captured, which can help your optometrist assess and diagnose any eye issues and or diseases sooner than later. What kinds of eye diseases and eye conditions can a digital retinal image detect? What happens during the retinal imaging part of my exam? During the exam you will be asked to look into a medical device which will flash. After the flash an image will be produced immediately and saved as part of your patient file. You may require dilation if your pupils are too small. Digital retinal images allow for a greater degree of assessment, and also allow the ability to track changes over a period of time. This ultimately can help identify problem areas sooner than later. We are happy to provide our patients with this advanced care. Want to know more? Give us a call.